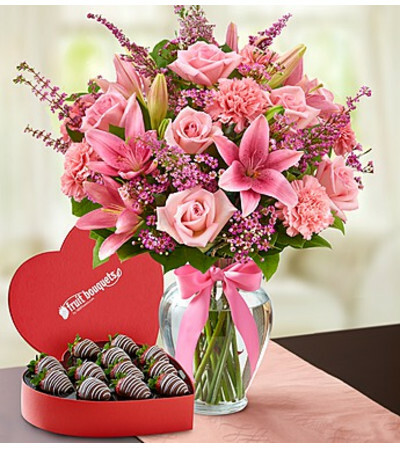 There's always a reason to express your feelings in the sweetest way possible! Start with a heart-shaped box of decadent, hand-dipped strawberries to leave them smiling. 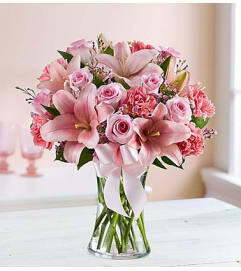 Then add our hand-arranged bouquet of the freshest pink roses, lilies, carnations and more, for the perfect pair of surprises to celebrate any occasion. 12-piece heart-shaped box includes 12 large strawberries dipped in milk chocolaty confection and topped with white chocolaty swirls. 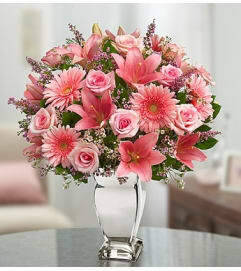 Arrangement of pink roses, lilies, carnations, waxflower and heather, accented with salal.